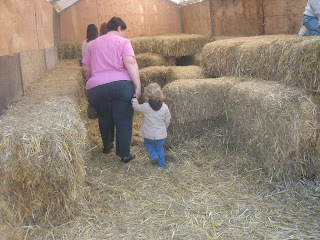 We went to a pumpkin patch on Saturday and we had lots of fun. 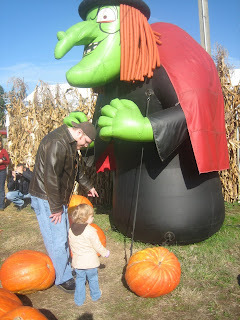 Zoey wasn't so sure about things at first, especially the big blown up witch. She was a little scared of it. We invited Bryce's mom, Carolyn to come with, which she was planing on picking up some of their very delicious apple cider. 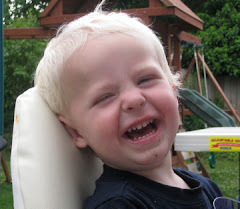 It's like eating a apple. So good. 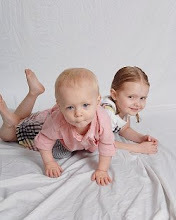 Anyway, Zoey wasn't so sure on what to do there. 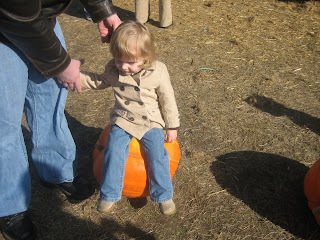 Once we started to pick out a pumpkin, she kind of got the idea of picking the pumpkins up so she tried with a big one, which didn't work out so well. 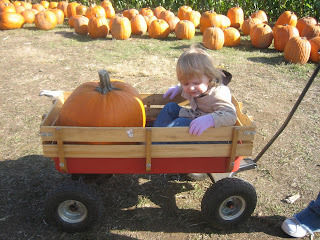 But we found some small ones that she started to pick them up and put them in the wagon we had. They had a lot of other things there other than a pumpkin patch. 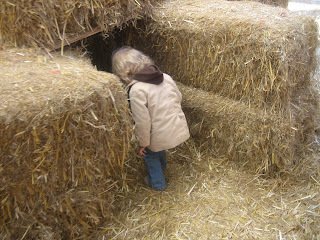 They had a small place under a tent where there was a hay maze. 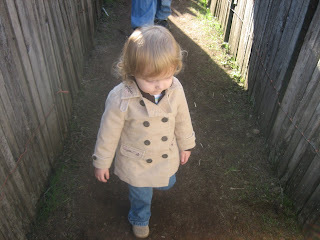 Zoey was a little unsure at first but then had lots of fun going under and through the tunnel. They also had a fun little fort maze as well. It was $1 for each person to go into the fort maze, but we all went in except for grandma. 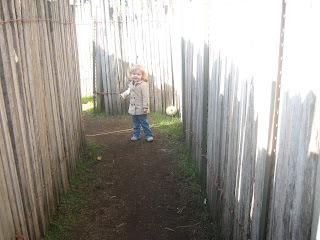 She had fun guiding the way around the maze. There was a little place the was like an actual fort. It has stairs to climb and a few spots to look out. 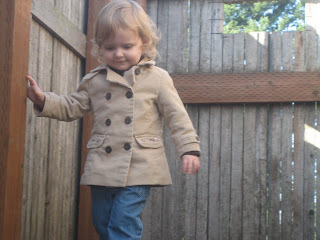 Of course she loved just going up and down the steps. 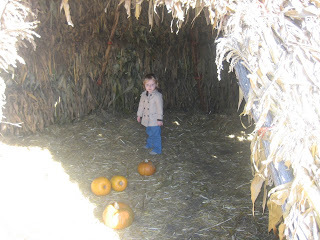 There was also a big tepee that was made from corn stalks. Again, Zoey wasn't so sure until I went in with her. There was a family that came in and all she did was stare at them. 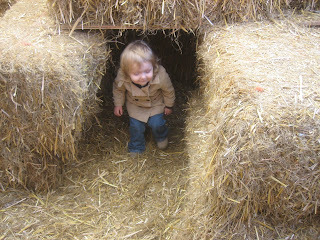 Here is a picture of her in the big tepee before all the people came in. It was a huge tepee. 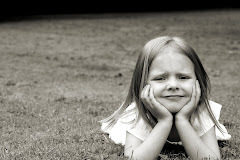 She had fun once she got use to what was going on. She saw a lot of people walking around eating apples so she was demanding one or saying that she "needs" an apple. Carolyn bought about 1 1/2 pounds of apples, which are so much better then ones you get from the store. 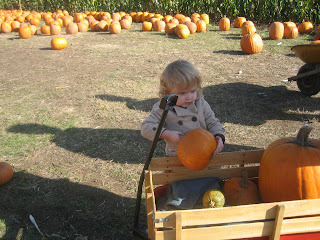 Zoey got to hold the pumpkin carving kit, which she enjoyed. We came home with a 34 pound pumpkin and one small pumpkin for Zoey to paint, plus a gallon of the best apple cider, 1 1/2 pounds of fresh yummy apples. 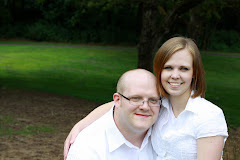 Love the new site look. Would REALLY love to see some pics of Zoey in her Halloween costume! What was she this year? I'm sure that whatever it was, it's super cute.